Secret super-powers. The Beaumont family always discover their ‘savvy’ on their 13th birthday. When Fish turned 13 the family had to move inland, because the storms he caused were too dangerous near any large body of water. Rocket (16) is electric. Grandpa can make land - when Mom and Pop married he made them six acres as a wedding present, moving neighbours’ homes further apart without their noticing. Pop doesn’t have a savvy; his family’s talent is losing all their hair by 30. 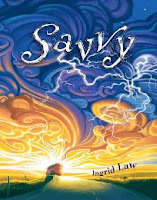 Mom’s savvy is to be perfect - not an easy one. Grandma used to catch radio waves, so there are jars of happy tunes and inspiring speeches all over the house. A great book for kids? If you’ve got readers, they’ll just gobble it up. It’s a gorgeous book, about a quirky but happy family who look after each other, and about teenagers finding their way. Oh yes. Mibs (for Mississippi: the kids on the school bus call her Missy Pissy), turns 13 as it starts. She’s dying to see what her savvy will be - but it’s no longer important on the day. Poppa’s car is crushed in a crash, and he’s hospitalised far away, in Salinas, Kansas. Her savvy isn’t raising the dead and healing the halt? What do you think? Mom, Grandpa and little Gypsy take the family clunker to Salinas, bringing Rocket to charge the battery. Mibs decides she has to get to Salinas too, and hides away in Lester the Bible salesman’s bus with brothers Fish and Sampson - and Will Meek, the preacher’s son she fancies, and Bobbi, his cool sister. A Bible salesman? A flake? Far from it - Lester is dead sound, and when he stops to rescue Lill the waitress, whose car has broken down, things get even more interesting. Good idea. I love this book. Sweet, kindly, courageous, funny, hopeful. Love it.